Abstract: The Neogene-Quaternary infill of the Orava-Nowy Targ Intramontane Basin comprises two tiers showing contrasting lithologies. The Neogene tier is largely composed of claystones and siltstones, whereas the Quaternary tier is dominated by gravels. The two sequences are separated by an erosional surface underlain by a regolith. Deposition of the Neogene sequence took place during subsidence of the basin. No prominent relief existed in the area of the present-day mountains actually surrounding the basin at that time. The regolith started to form at the onset of basin inversion. Still, no prominent relief existed in the present-day mountains. The onset of deposition of Quaternary gravels in the basin corresponds to acceleration of uplift of the surrounding mountains, which has been continuing until now. The Pieniny Klippen Belt has been subject to erosion, at least locally, from the deposition of the basal part of the Neogene sequence filling the Orava-Nowy Targ Basin until present times. In contrast, the Paleogene cover of the Tatra Mts was removed only during the Quaternary. 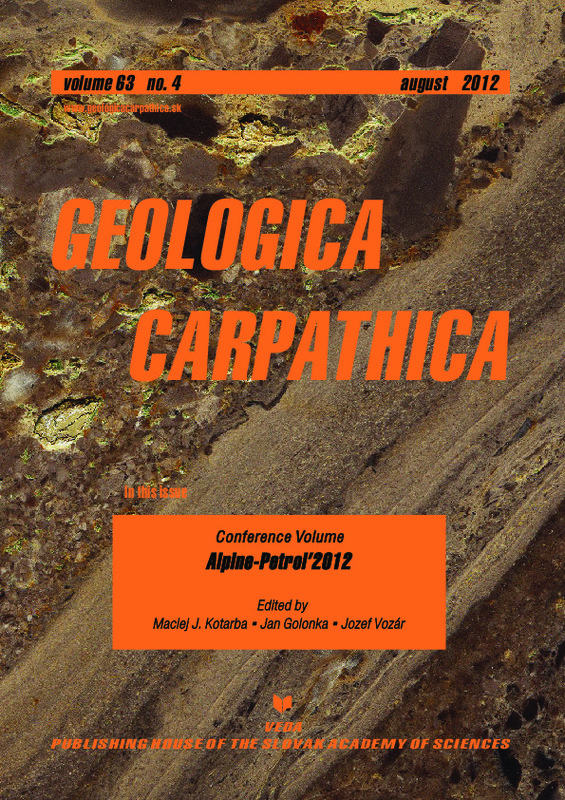 Abstract: The Machów Formation belongs to a supra-evaporitic succession of the Polish Carpathian Foredeep Basin (PCFB). Our studies were concentrated in the eastern part of the PCFB, north of Rzeszów. 33 samples were collected from five boreholes, at depth intervals as follows: Stobierna 2 — 1016–1338 m; Stobierna 3 — 715–1669 m; Stobierna 4 — 1016–1238 m; Stadnicka Brzóza 1 — 350–356 m and 1043–1667 m; Pogwizdów 2 — 1161–1390 m. The obtained biostratigraphical data gave evidence for the upper part of the NN6 (the Early Sarmatian) and for the NN7 (the lowermost part of the Late Sarmatian) Zones. All the nannofossil assemblages from Stobierna 2, Stobierna 4 and Pogwizdów 2 were assigned to the NN6 Zone. In the Stobierna 3 borehole the interval 1669–1113 m was assigned to NN6, whereas assemblages from depth interval 843–715 m belong to NN7 Zone. In Stadnicka Brzóza 1 interval 1667–1043 m belongs to NN6 Zone and interval 350–356 m to NN7 Zone. The Discoaster exilis Zone (NN6) was defined by the presence of Reticulofenestra pseudoumbilica, Sphenolithus abies, Helicosphaera walbersdorfensis and absence of Discoaster kugleri. The Discoaster kugleri Zone (NN7) assignment was based on the abundance of Coccolithus miopelagicus (>10 µm), used as an alternative species essentially confined to that interval, and absence of Catinaster coalithus. The observed nannoplankton assemblages are predominantly composed of a high number of redeposited material, abundant long-ranging taxa and taxa resistant to carbonate dissolution. General assemblage compositions, obtained from quantitative data, indicate shallow near-shore environment and could confirm basin isolation. Abstract: In the present paper we apply a multi-technique approach (shale compaction data, seismic stratigraphy, isopach maps, moisture content of lignite, fission track data) to assess timing and amount of uplift and erosion of the Alpine Foreland Basin. The combination of the different techniques allows us to discriminate the effects of two different erosion events during the Neogene: (1) Seismic stratigraphy and isopach maps indicate a Karpatian (Early Miocene) regional tilting of the basin to the west (slope of about 0.5 %) and a minor erosion phase. (2) Moisture content of lignite combined with fission track data provides evidence for extensive regional uplift after deposition of Late Miocene fluvial deposits. It is estimated that sediments, 500 to 900 m thick, have been eroded. Shale compaction data derived from sonic logs indicates additional uplift of the eastern part of the basin (near the river Enns). Here, 300 to 1000 m of sediments were additionally eroded (giving a total erosion of about 1000 to 1900 m! ), with a general increase of erosion thickness towards the northeast. While the regional uplift is probably related to isostatic rebound of the Alps after termination of thrusting, the local uplift in the east could be affected by Late Neogene E-W compressional events within the Alpine-Pannonian system. Both, tilting and erosion influence the hydrocarbon habitat in the Molasse Basin (tilting of oil–water contacts, PVT conditions, biodegradation). Abstract: Hydrocarbon gases from Upper Devonian and Lower Carboniferous reservoirs in the Paleozoic basement of the Polish Carpathian Foredeep were generated mainly during low-temperature thermogenic processes (“oil window”). They contain only insignificant amounts of microbial methane and ethane. These gaseous hydrocarbons were generated from Lower Carboniferous and/or Middle Jurassic mixed Type III/II kerogen and from Ordovician–Silurian Type II kerogen, respectively. Methane, ethane and carbon dioxide of natural gas from the Middle Devonian reservoir contain a significant microbial component whereas their small thermogenic component is most probably genetically related to Ordovician–Silurian Type II kerogen. The gaseous hydrocarbons from the Upper Jurassic and the Upper Cretaceous reservoirs of the Mesozoic basement were generated both by microbial carbon dioxide reduction and thermogenic processes. The presence of microbial methane generated by carbon dioxide reduction suggests that in some deposits the traps had already been formed and sealed during the migration of microbial methane, presumably in the immature source rock environment. The traps were successively supplied with thermogenic methane and higher hydrocarbons generated at successively higher maturation stages of kerogen. The higher hydrocarbons of the majority of deposits were generated from mixed Type III/II kerogen deposited in the Middle Jurassic, Lower Carboniferous and/or Devonian strata. Type II or mixed Type II/III kerogen could be the source for hydrocarbons in both the Tarnów and Brzezówka deposits. In the Cenomanian sandstone reservoir of the Brzezowiec deposit and one Upper Jurassic carbonate block of the Lubaczów deposit microbial methane prevails. It migrated from the autochthonous Miocene strata. Abstract: The Jurassic/Cretaceous stratigraphic complex forming a part of the sedimentary cover of both the eastern Malopolska Block and the adjacent Lysogóry–Radom Block in the Polish part as well as the Rava Rus’ka and the Kokhanivka Zones in the Ukrainian part of the basement of the Carpathian Foredeep were studied with geochemical methods in order to evaluate the possibility of hydrocarbon generation. In the Polish part of the study area, the Mesozoic strata were characterized on the basis of the analytical results of 121 core samples derived from 11 wells. The samples originated mostly from the Middle Jurassic and partly from the Lower/Upper Cretaceous strata. In the Ukrainian part of the study area the Mesozoic sequence was characterized by 348 core samples collected from 26 wells. The obtained geochemical results indicate that in both the south-eastern part of Poland and the western part of Ukraine the studied Jurassic/Cretaceous sedimentary complex reveals generally low hydrocarbon source-rock potential. The most favourable geochemical parameters: TOC up to 26 wt. % and genetic potential up to 39 mg/g of rock, were found in the Middle Jurassic strata. However, these high values are contradicted by the low hydrocarbon index (HI), usually below 100 mg HC/g TOC. Organic matter from the Middle Jurassic strata is of mixed type, dominated by gas-prone, Type III kerogen. In the Polish part of the study area, organic matter dispersed in these strata is generally immature (Tmax below 435 °C) whereas in the Ukrainian part maturity is sufficient for hydrocarbon generation. Abstract: Burial history, thermal maturity, and timing of hydrocarbon generation were modelled for the Jurassic source rocks in the basement of the Carpathian Foredeep and marginal part of the Outer Carpathians. The area of investigation was bounded to the west by Kraków, to the east by Rzeszów. The modelling was carried out in profiles of wells: Bedzienica 2, Debica 10K, Góra Ropczycka 1K, Goleszów 5, Nawsie 1, Plawowice E1 and Pilzno 40. The organic matter, containing gas-prone Type III kerogen with an admixture of Type II kerogen, is immature or at most, early mature to 0.7 % in the vitrinite reflectance scale. The highest thermal maturity is recorded in the south-eastern part of the study area, where the Jurassic strata are buried deeper. The thermal modelling showed that the obtained organic matter maturity in the initial phase of the “oil window” is connected with the stage of the Carpathian overthrusting. The numerical modelling indicated that the onset of hydrocarbon generation from the Middle Jurassic source rocks was also connected with the Carpathian thrust belt. The peak of hydrocarbon generation took place in the orogenic stage of the overthrusting. The amount of generated hydrocarbons is generally small, which is a consequence of the low maturity and low transformation degree of kerogen. The generated hydrocarbons were not expelled from their source rock. An analysis of maturity distribution and transformation degree of the Jurassic organic matter shows that the best conditions for hydrocarbon generation occurred most probably in areas deeply buried under the Outer Carpathians. It is most probable that the “generation kitchen” should be searched for there. Abstract: The chemical compositions and activity concentrations of 238U, 234U, 226Ra, 228Ra and 222Rn were measured in the thermal waters occurring in the Podhale Trough. This region, part of the Polish Inner Carpathians, is the artesian basin situated between two groundwater recharging zones, the Tatras to the south and the Pieniny Klippen Belt to the north. The thermal water samples were collected from nine selected boreholes with the depths from 1113 m (Zakopane IG-2) to 5526 m (Banska Nizna IG-1). The waters belong to four hydrochemical types: HCO3-SO4-Ca-Mg-Na, SO4-HCO3-Cl-Na-Ca, SO4-Ca-Na and SO4-Cl-Ca-Na. Their mineralization and temperature range from several hundreds to 2500 mg/l and 23.9 to 86.3 °C, respectively. Excluding the waters from the Szymoszkowa GT-1 and Chocholów PIG-1 boreholes, the activity concentrations of the uranium and radium isotopes in the waters are relatively low and vary from decimals to above ten mBq/l and from several tens to about 600 mBq/l, respectively. They are classified as radon-poor waters. The phenomena mentioned seem to be characteristic of the waters draining limestone formations overlaying the crystalline rocks, namely the principal aquifers in the Tatras. The significant levels of the uranium and radium activity concentrations in the waters from Szymoszkowa GT-1 and Chocholów PIG-1 can be connected with the presences of Lower Triassic black shales with tuffites rich in uranium in the respective recharge areas. Comparing the parameters of the Podhale thermal waters with those of some selected thermal waters occurring in other regions of Poland and in north-west Croatia, the French Massif Central, Spanish Andalusia and north-east Tunisia, the authors found that the temperature of the thermal waters is contained between 16 and about 100 °C; the mineralization and concentrations of radionuclides vary in broad intervals and are considerably affected by the lithology and the geological structure of the region. The 226Ra activity concentration exceeds that of 228Ra in almost each of the thermal waters compared, which is similar to the waters from Podhale.